Air Cleaning Technologies is the trusted name for cooling tower repairs, cooling tower maintenance, and cooling tower cleaning in Bowie, Maryland. In order to be successful in this business, you must have the best people on your team. Our cooling tower cleaning, cooling tower maintenance, and cooling tower repair technicians are highly trained, dedicated professionals. They take their craft seriously, and they adhere to very high personal standards. This is one of the keys to our ongoing success, and when you add in our low prices for cooling tower services, you have a winning formula. Bowie is a rich repository of history, with many sites to explore that are listed in the National Register of Historic Places. These would include Belair Stables, Melford, Williams Plains, and Pleasant Prospect, just to name a handful. Locals are well aware of the high quality of life that the town provides, and the national media has taken notice as well. It has been included on CNN Money’s list of the top 100 places to call home in the United States, finishing in the top 30. We have assisted many local businesses, and we know the city very well. If you are in Holmehurst, Woodmore, Brookland, the Race Track Road/Idlewild Drive area, or any other part of Bowie, MD, a cooling tower repair, cooling tower maintenance, and cooling tower cleaning resource will always be standing by to assist you. 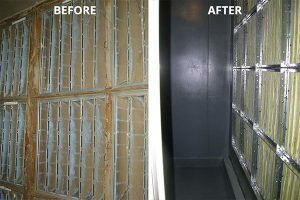 In addition to the work that we do with cooling towers, we are also air handler maintenance and air handler repair experts. If you need an air handler repair in Bowie, Maryland, you can rest assured that we will be on the scene in a flash, and it is very likely that we will be able to correct the problem on first visit. Air handler maintenance is another service that we offer, and you can preserve energy efficiency and prevent major mechanical problems if you engage us to provide ongoing air handler maintenance. For air handler repairs, air handler maintenance, cooling tower repairs, cooling tower cleaning, and cooling tower maintenance in Bowie, Maryland, ATC is the right choice. Whenever you need us, we can be reached by phone at 703-547-1680, and if the situation is not a full-scale emergency, you have the option of sending us a message through our contact page.